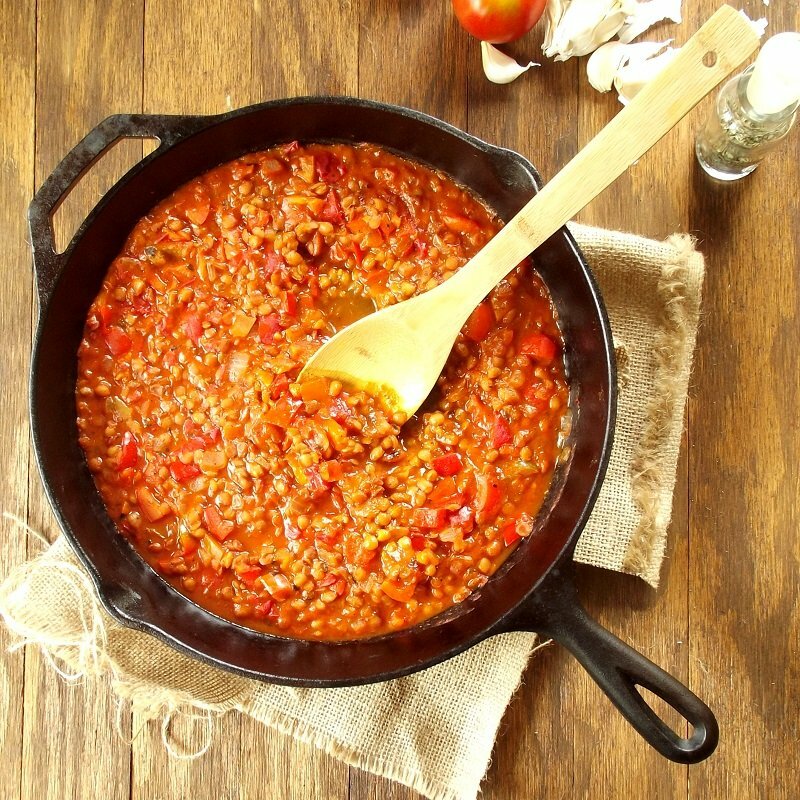 This hearty vegan lentil Bolognese sauce made with tomatoes and red bell peppers comes together in less than 30 minutes! This might not be a traditional Bolognese sauce. What? You mean the folks over in Bologna aren’t dining in spaghetti topped with lentils? Well, no. I mean, yes, they’re probably not, but that’s not what I’m talking about. Obviously, this isn’t a traditional Bolognese sauce in that sense. It’s vegan, and if there’s one thing I do know about Bolognese sauce, it’s that it is, pretty much by definition, not vegan. So setting that part aside, I’m not sure whether this sauce would otherwise be considered a vegan version of a traditional(ish) Bolognese sauce. Maybe it’s a Ragu (another(?) meat sauce). Maybe it’s something different. I started Googling around to figure out what I’d created, and then I stopped. Do I really care about the subtle differences that come into play in meat sauce classification? Nah. Probably not my thing. What really matters to me is that this sauce is good. And easy. And pretty darn healthy. 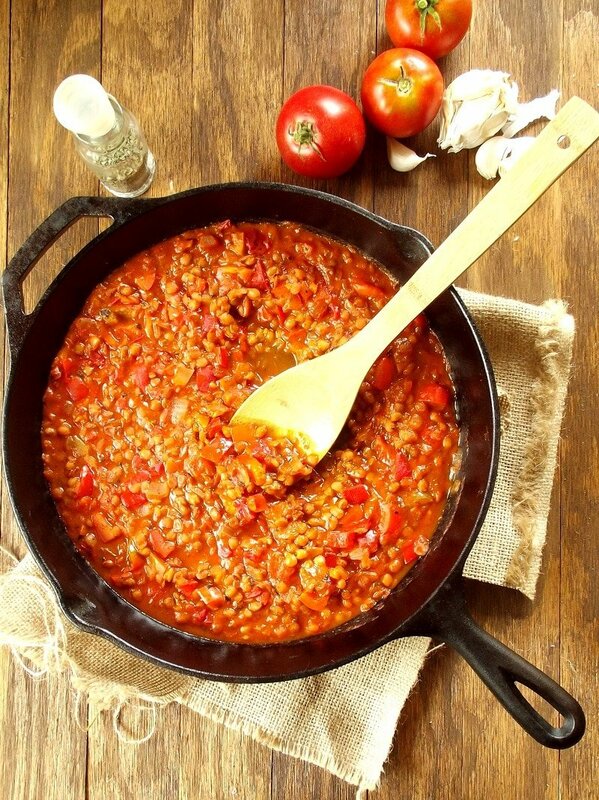 I’m deeming it “Lentil Bolognese Sauce” because I created it, so I can. (I’m also a trademark attorney, so I know I can!) It also just sounds cool. As far as I know (and apparently I know very little about these things), Bolognese sauce, or Ragu, or any other meaty, tomato-based sauce, would normally be served over pasta, and I absolutely recommend doing that. I have a hard time convincing myself that it’s okay to eat a big plate of carbs for dinner. Throwing some protein and veggies over that big plate of carbs always helps. This sauce takes all of 25 minutes to prepare, and since pasta generally takes less than 15 minutes to cook, you can pair it with some pasta and have a 25 minute meal on your hands. I didn’t actually put this over pasta though. I had other plans for this sauce, which I’ll share pretty soon. Heat oil in a large saucepan over medium-high heat. Add onion and saute until softened, about 5 minutes. Add garlic and saute another minute, until fragrant. Add all remaining ingredients and lower heat to medium. Simmer about 15 minutes, until peppers are tender and sauce has thickened a bit. Mmm I love a lentil bolognese! I also make a lentil based pasta sauce. It’s pretty much the perfect texture, and super nutritious. Looking forward to seeing what you do with this! I can’t seem to find canned lentils anywhere, though I can get lentil soups. And yes, I’m too lazy to make my own lentils every time I want them. What do you think about using the lentil soups in recipes? Maybe get rid of the liquid? If I did go crazy and make up a bunch of lentils, could I portion them out and freeze them to use in later recipes? This sauce looks great, but I get the feeling I’d be the only one eating it, so I don’t need to make a lot at any one time. Thanks. Oh great idea! I love mousakka! 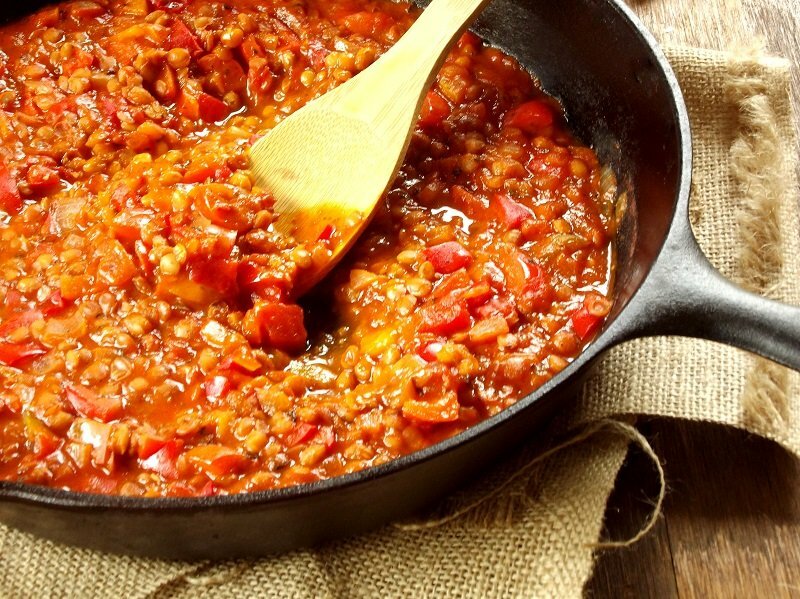 would roasted red peppers (jarred) work in this recipe? I use them in my lasagnes and it gives such a nice smoky flavour, that I’m wondering if I could get with this spag bol?? I think jarred peppers would work! yummy – and easy! I just made a half-size portion to try it out, seeing we had all the ingredients in the pantry. I subbed salt for my magic mushroom powder (essentially seasoned salt) and whilst it was simmering I added a splash of red balsamic vinegar (because I’m addicted to it, lol). It is surprisingly tasty!!! I am the only meat eater in my house, so I’m super stoked to enjoy it so much. That sounds delicious!! I’m so glad you enjoyed this! Thanks Ally! 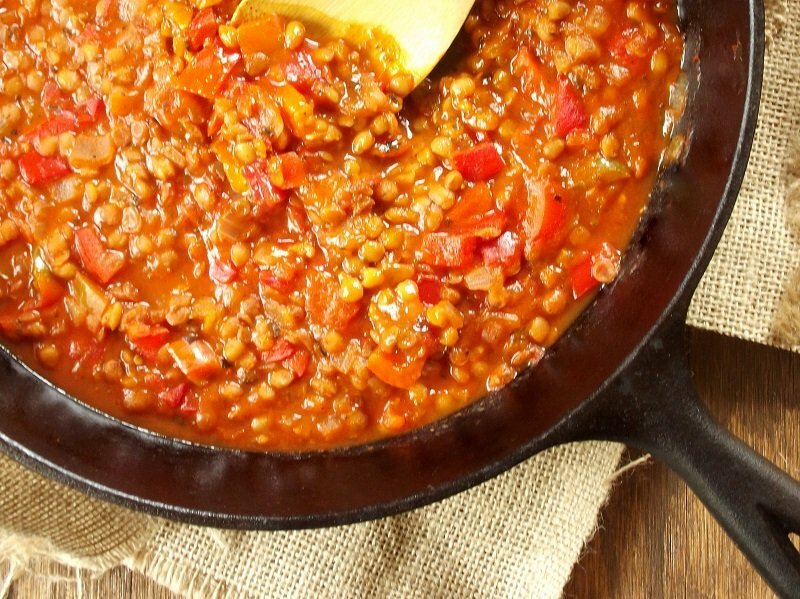 I made this recently after searching for green lentils recipes, and it was easy to make and so delicious–thanks for sharing! Tomatoes in a cast iron pan? I was told that’s a no-no. Acid breaks down the pan surface. Could this be made in a slow cooker? Looks delicious! Thanks Michelle! I’m sure it could, but I haven’t tested it out, so I’m not sure as to the setting and cook time. This was really yummy! It tastes so much like a meat bolegnaise which I loved because i’m vegan but miss the meat taste in dishes. Thanks for this. Am definitely going to make it again!!!! I served it with zoodles and ur was delish!!!! Yay! Sounds like a delicious meal! Glad you enjoyed it!